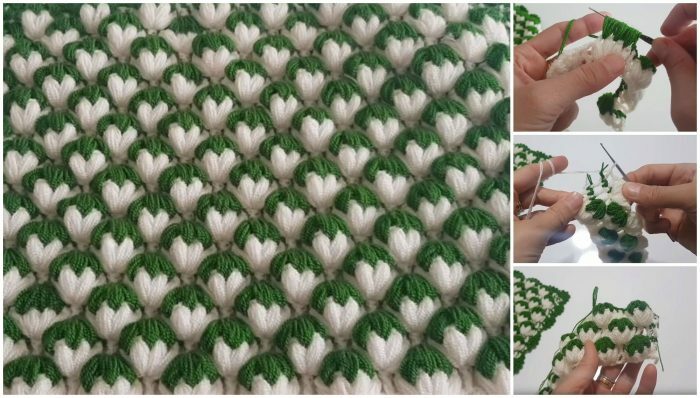 Learn how to crochet this gorgeous strawberry field blanket using the step by step tutorials in different languages. The basic stitch technique of this blanket is a strawberry stitch and like any good tessellation, these rows fit together without any gaps. In addition, when they’re oriented correctly, they join to create an awesome 3D effect. I have always had a passion for crochet blankets and always enjoyed making them using all kind of different stitches. However, I think this is one of my all time favourite baby blanket. It looks amazing and I’m sure you’ll love it as much as I do. So, here you can find free crochet instructions in Turkish and English languages that minutely explain each and every step of making this strawberry field baby blanket. Just follow the tutorials and make this pretty blanket for your sweet little children and grandchildren. These are free crochet tutorials in two different languages that minutely explain each and every step of creating this gorgeous strawberry field blanket. Enjoy yourself and always feel free to share your experience with us. Good luck and happy crocheting.